Let’s face it, I don’t have any more space in my house for any new furniture. So, when I headed out today to the Big Sale at Faith Farm, I knew I’d be buying some pieces to re-do so I could sell them. But, I think I might have gone a little overboard today. I just know that my husband probably will be accompanying me to the next sale, and holding on to the credit card. Yikes. Here are a few of the things I bought today. 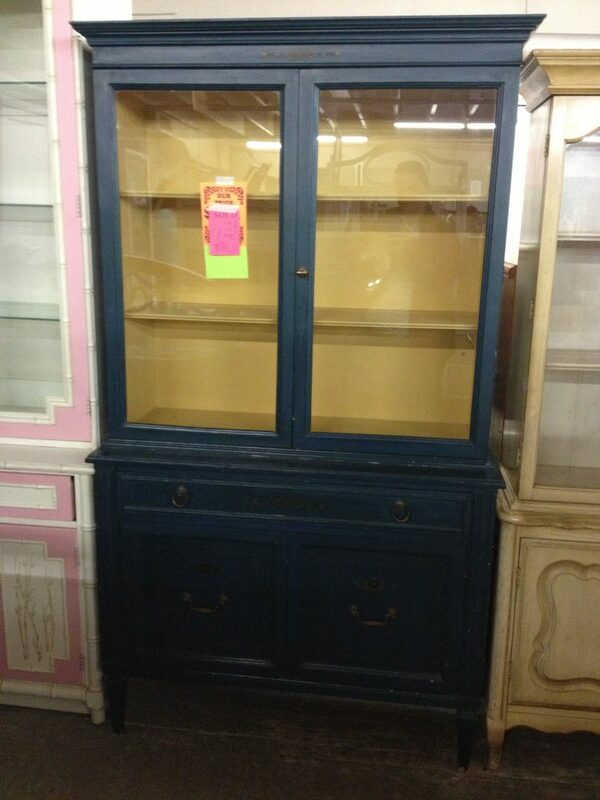 Can you picture this bamboo cabinet in a bold and fun color? Yeah, I’m thinking Big Bertha needs to live at my house – after an update of course. I love that she has more “show space” than our current china cabinet, is a little taller, with a curved top – which matches the (stupid) niche that it sits in, and that it has legs instead of sitting flat on the floor. And I swooned over the detail of the grates (what are they called, anyway?) in front of the glass. 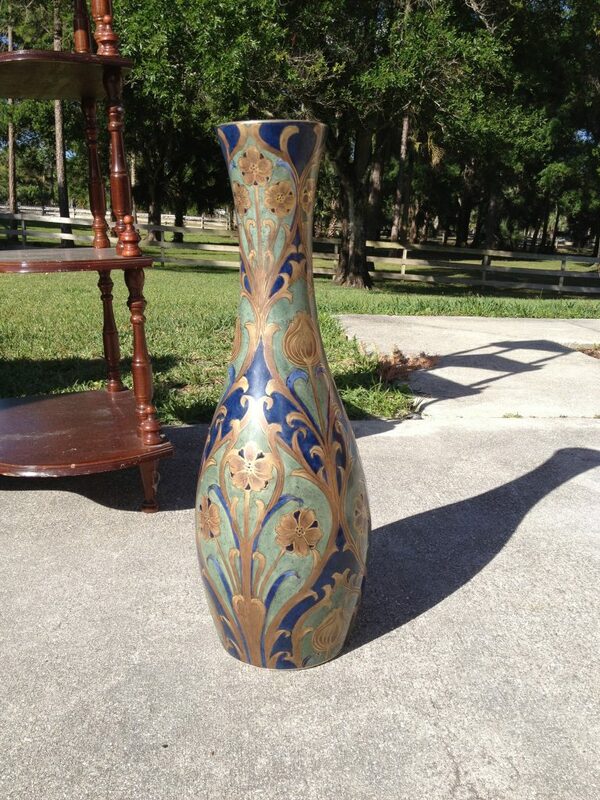 This vase has some of my favorite colors in it. Unfortunately, as beautiful as it is, I can’t seem to find a place to put it. UGH! I hate when I don’t think about that before I bring it home. 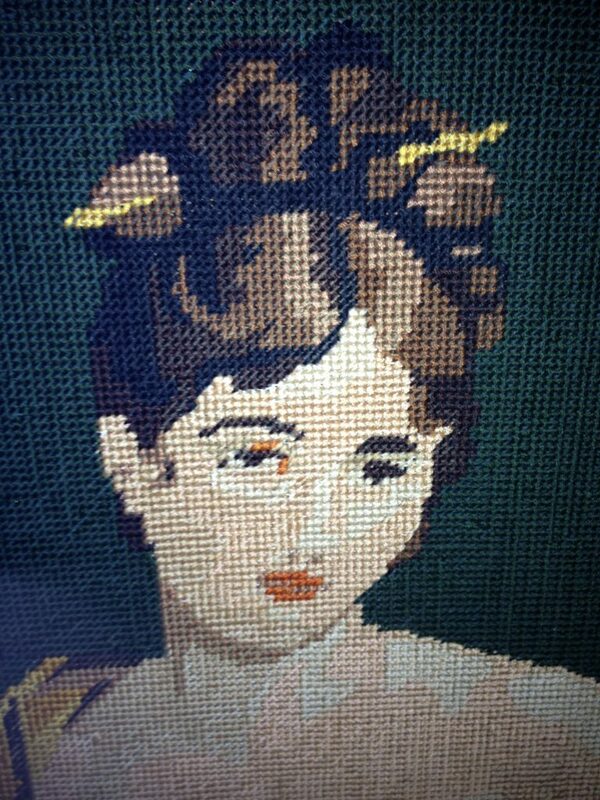 I really need someone to come over to my house and style it for me. I am the WORST at styling. 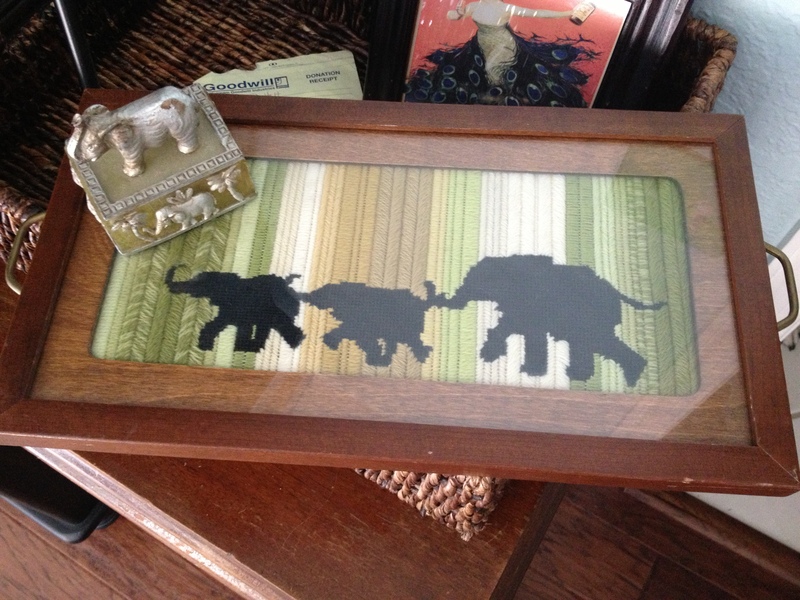 My friend Tracy has a daughter who loves – LOVES – elephants. She even set up a Pinterest page just for her, so she can look at her elephants any time she wants. So these two little treasures were a perfect little find for her. 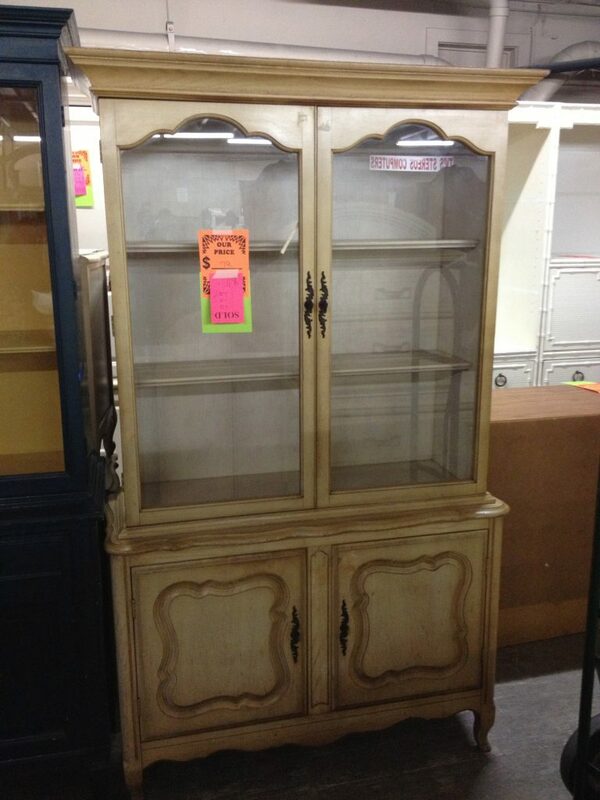 Mahogany Cabinet – has a cool vibe to it. 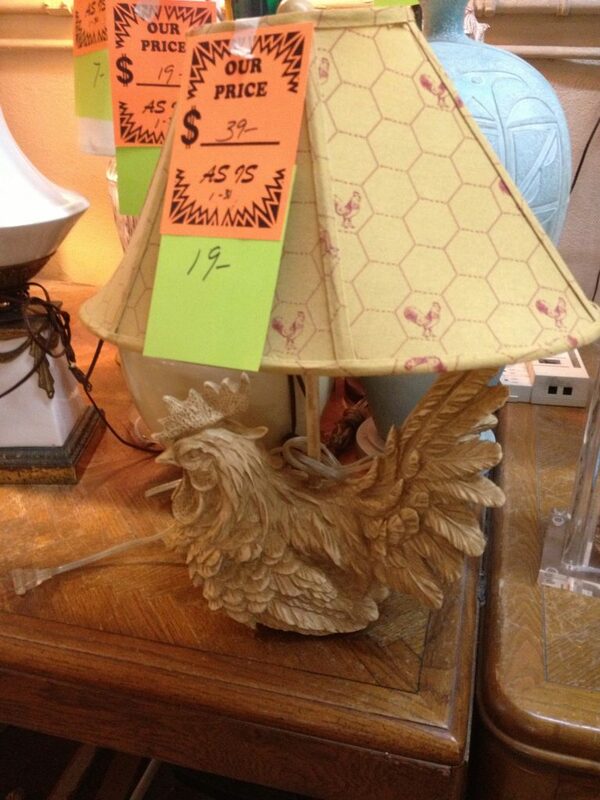 And finally, the thing that made me laugh today… the rooster lamp. No, I didn’t buy it. But the lady who did was squealing with delight as she picked it up and flagged down the salesman to write her up for it. I think that’s part of the beauty of thrift shops – one man’s laugh, err… I meant trash, is another one’s treasure. 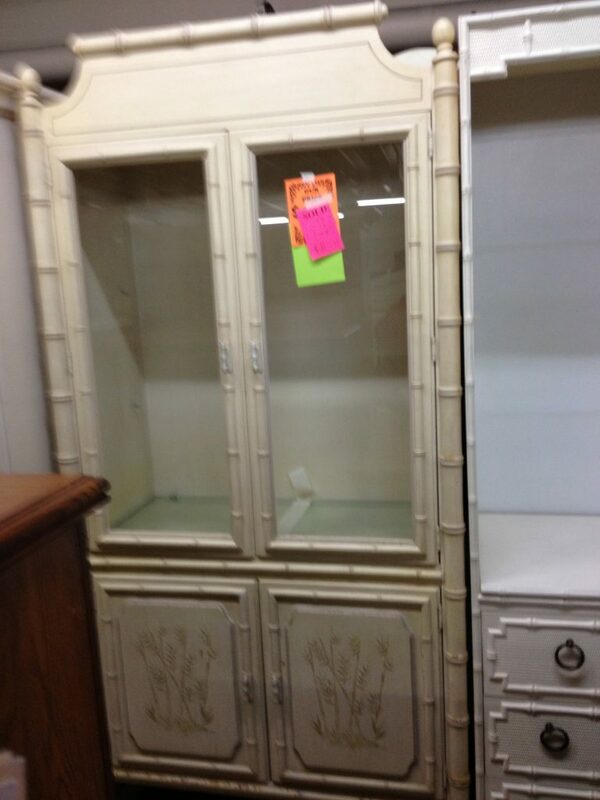 I did find more cabinet, but I didn’t take a picture of it. It’s another huge one, a lot like the one I painted white and blue a while back, but this one is much wider. I also found an Ethan Allen table for our dining room, a faux bamboo chippendale-style sofa table, a drop leaf table I will be using for a sewing/craft table and a few little pictures. 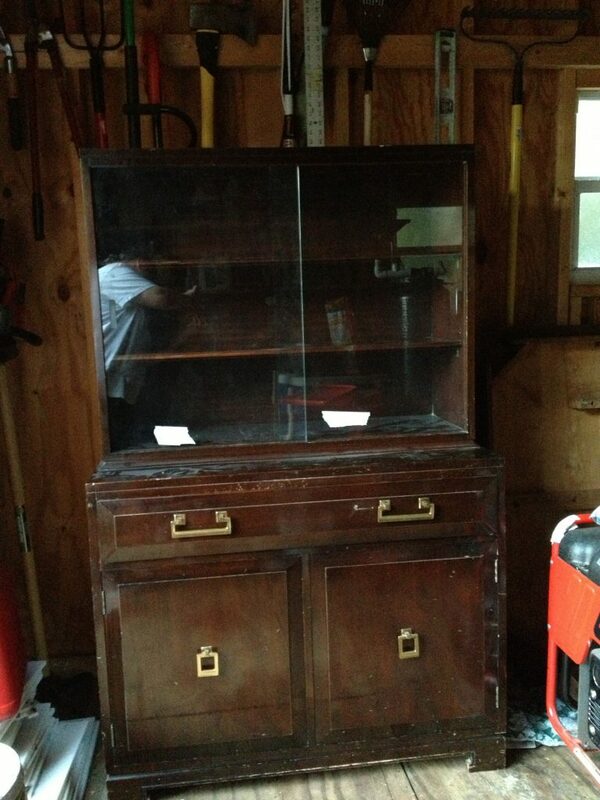 I still have to go pick up five of the cabinets in the morning – after I clean out more of our garage. 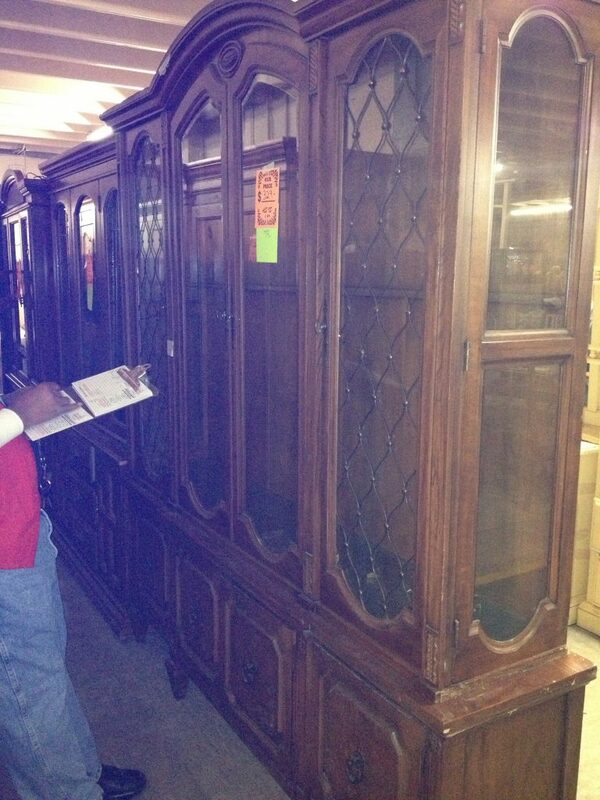 Since I found a china cabinet I love more than the one I currently have, I have to sell the old one. Same with the dining room set, and the little table I currently have in my office. Guess who will be up early to get the Craigslist ads online? Yeah, me. Although I love buying off Craigslist, selling stuff on there still gives me the heebee-jeebees. I’m always convinced something scary or creepy is going to happen. Anyone else feel that way? I just remembered that I didn’t show you the console yet! You know, this one. Ahhh… yeah, that’s not going to happen yet. I finally finished the second and third coats of paint and put the doors and hardware back on – but now I’m waiting for the paint to cure a little before I start putting stuff back on it. Should be good to go in a few more days. I would hate to put stuff back on there too early and ruin the finish. But I love the way it changed the feel of the room. And I changed a few other things in here too. I’m headed to do some laundry and clean up the mess that has been made while I was painting. Please tell me that I am not the only one that forgets everything else while I’m painting or doing another project?! Hope you have a great weekend, and that your favorite team wins the Super Bowl. I personally don’t care who wins this year – I’ll just be watching for the commercials – and although I’d like to say that just because my team didn’t make it there this year (again), I’d be lying – I never watch the game. Okay, okay, I did ONCE when our team was in it, but they blew it, so I went back to commercial watching. SCORES! 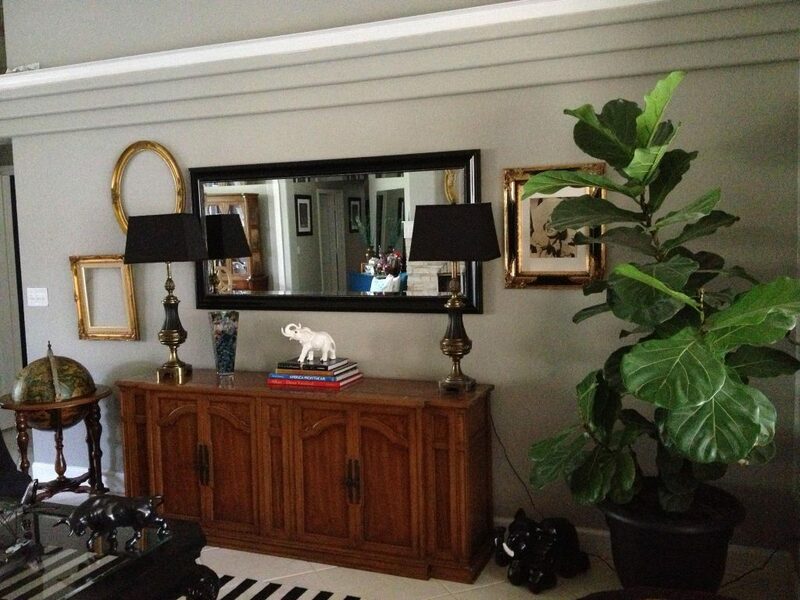 I would LOVE that bamboo piece (don’t have a place for it in my house, unless it could fit in my bathroom. If you have a problem, that means I have a problem… wonder if there is a name for it? LOL! I love seeing all the pieces you transform – they give me inspiration. 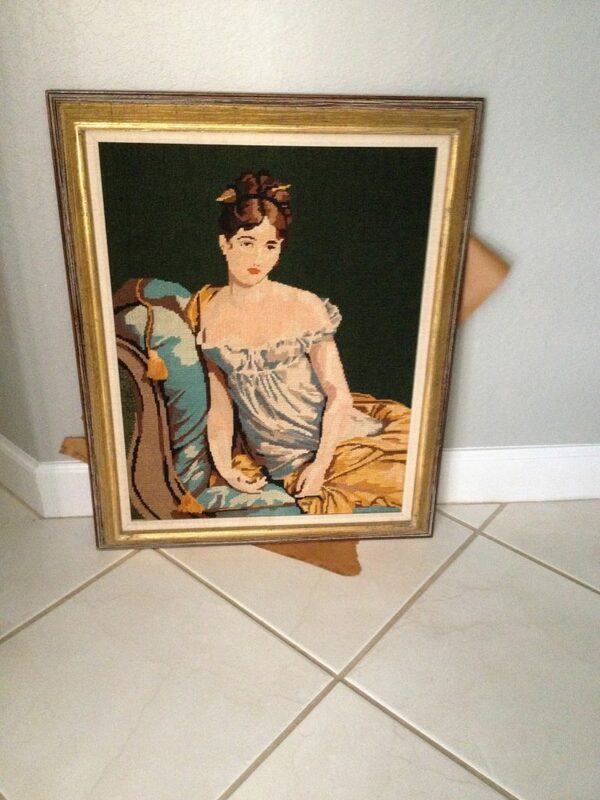 I think you’re awesome and found some really good pieces here…. especially the elephant ones for my little Angie 😉 Can’t wait to see how you transform them!! Eliesa! Did you buy all of those? My personal favorite one is the second pictured blue one…love the lines on it. You have your work cut out for you but I can’t wait to see them! Yes, and a few more! We still haven’t been able to get them all in the house! We are trying to figure out work space around here, so it’s going to be a little slow to get them all done. Already have a few people interested in buying some pieces – yay! Love that elephant box! New follower from Tea on Tuesday, and fellow self-confessed Pinterest addict! I get to see her next week, and I’m pretty excited to give it to her 🙂 Thanks for stopping by – headed over your way! I’ve thought so many times about buying furniture and redoing it! How do you find out about the sales? Do you resell on CraigsList or some other way? Great finds! Can’t wait to see what you come up with! Thanks! I am always at FF, so I hear about it from the sales guys. But they also advertise it on the radio. I have sold a few things on Craigslist, but I am going to have to figure out a different way because having people come to my house gets me too nervous. Maybe consignment? Oh my lord! I need to go to a Big Sale like that! I can’t wait to see them…. 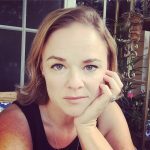 New follower from Social Link Up!